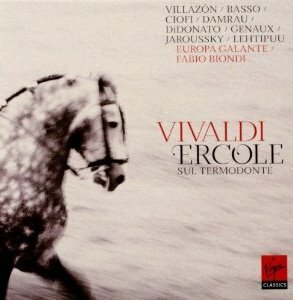 There's some pretty wonderful stuff in this recording of Vivaldi's Ercole sul Termodonte (1722) with Fabio Biondi and Europa Galante. This performance is yet another result of the current burst of Italian musicology. The booklet that comes with the CDs describes the process required to revive this opera and recreate the original score. The opera was written for Rome, and even at this late date the roles seem all to have been performed by men, either castrati or tenors. The casting for the recording is somewhat curious. Hercules and his band of Greeks have been tasked with stealing the arms of Antiope, the queen of the Amazons. The Greek roles consist of two tenors and two mezzo-sopranos: Ercole (Hercules) is sung by Rolando Villazon; Teseo (Theseus) is sung by Romina Basso, a female mezzo, not a bass; Alceste is sung by Philippe Jaroussky, the only countertenor; and Telamone is sung by another tenor, Topi Lehtipuu. Both camps, Greeks and Amazons, are composed of two distinct types of personalities: lovers and fighters. For the Greeks the tenors represent the fighters, and the mezzos are the lovers. On the Amazon side Antiope, the queen, sung by Vivica Genaux, mezzo-soprano, and Orizia, her sister, sung by Patrizia Ciofi, soprano, are the fighters. Ippolita, another sister of the queen, sung by Joyce DiDonato, mezzo, and Martesia, the queen's daughter, sung by Diana Damrau, soprano, are the lovers. That's a lot of treble characters. Some are pissed off and want to kill people, while others are desperately in love and pine for their lovers. The plot has an annoyingly conventional ending with no one dying and both pairs of lovers getting together. And incidentally the queen gives Hercules her arms. They all live happily ever after in the by then well established tradition of Neapolitan Opera. By now in 2011 we are accustomed to the sound of Handel operas with their Germanic density of instrumentation. It's nice to hear this transparency. Italian opera is about singing. With this collection of singers there is a lot of fabulous singing. Everyone gets something nice, but the sweetest arias are for Joyce DiDonato. She shines. So does Rolando Villazon. It's a good recording.